If you are trying to further your professional career, you may have thought about getting an MBA, or even becoming a Chartered Financial Analyst (CFA). While there are advantages and disadvantages for each type of certification, no doubt if you’re considering the choice then the following question has arisen: Will one be significantly better than the other for my career? When it comes to choosing CFA or MBA, it's important to check out what will be required of you to attain it in terms of time and study, and what competitive edge each qualification will give your career. Here is how each type of certification will help you advance your skills, so that you can decide which one is right for you. MBA degrees, also known as the Master of Business Administration, is a globally recognized qualification that many postgraduates pursue in order to progress in their career. MBAs have been designed to help you develop the skills that you will require in both management and business. While an MBA is mainly used within the management and business sectors, it can also be helpful if you wish to pursue management level positions in the government, private industry, and public sectors too, as well as many other industrial areas too. When it comes to the MBA curriculum, there is usually a ‘core’ of subjects that include economics, accounting, operations, marketing, as well as certain ‘elective’ topics that will allow you to follow any of your own professional or personal interests. Along with this study, you may also be required to complete an internship at a particular organization or company. The benefits of this, however, is that it can potentially lead straight to a job opportunity after you complete the program. Due to MBA programs covering such a wide variety of professions, it has grown to become one of the most noted professional degrees today. The cost of such a qualification will be between $80,000–125,000 depending on your choice of program. Yet, with over 2,500 MBA programs available worldwide, there is no arguing the MBA's popularity. Becoming a CFA Charterholder, short for Chartered Financial Analyst, is a professional designation reached after passing 3 levels of exams and logging 4 years professional work experience in investment decision-making. While it is a world-renowned certification, it can only be attained through the CFA Institute. The CFA program covers a range of topics related to financial analysis including derivatives, investment management, bonds, stocks, and many other areas of finance. The cost of the program is between $2,400–4,590 depending on fee deadlines. Once you have successfully completed the CFA program and have met all the other professional requirements, you will then be awarded the title of CFA Charter, and become a CFA Charterholder. Most of those who reach this significant milestone spend roughly four years studying and taking the three different exam levels. While this program is globally recognized, the testing is rigorous and requires lots of self-motivation. Since most of the CFA and MBA programs are all recognized on an international level, they are both valuable in their own respects. It is worth bearing in mind that with the MBA degree you will build up relationships working alongside other students while the CFA program is self-guided study. So, which one is better for you? Here are a few decision-making tips that will hopefully make the process a little easier. When deciding CFA vs. MBA, keep your career goals in mind. Which of the two programs will best qualify your skills and best qualify you for your chosen career direction? If you want a broad yet comprehensive understanding of business and its key components, then an MBA may be for you. If you would like a thorough and in-depth knowledge of finance, then the CFA program is going to give that to you. When it comes to CFA vs. MBA, the amount of time you have to invest can play a big part of your decision. An MBA can take between two and four years on average, depending on the program you choose. The CFA program will take you an average of 300 hours study time for each of the three different levels to become a charterholder. You are also required to log four years professional work experience. However, this can be counted from before, during, and after your exam studies. If you are still unsure when it comes to the CFA vs. MBA, one of the best things you can do is to ask someone who has already gone through this decision personally. Discuss what they disadvantages and advantages they have found for each. This will offer you an outside opinion and perspective. 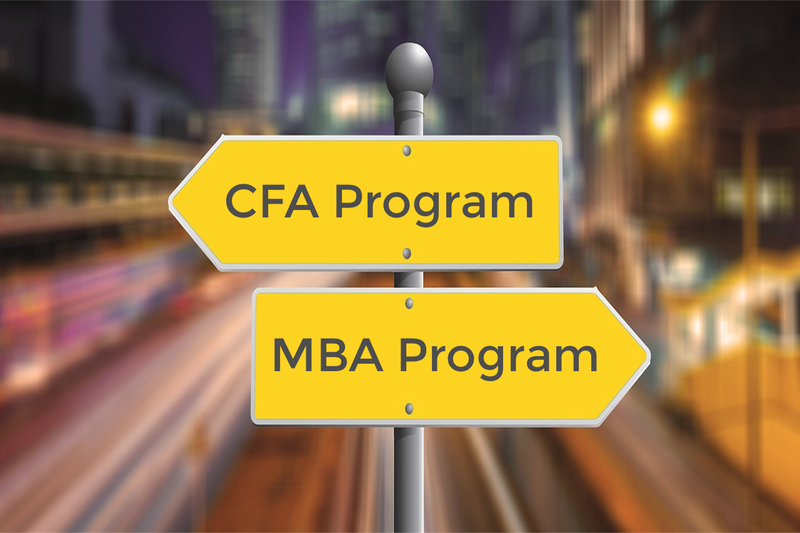 When it comes to choosing between the CFA vs. MBA, it is ultimately up to you. If you have more defined careers aspirations in the financial field, becoming a CFA charterholder is the way to go. If you are seeking a career within a broader range of sectors, then the MBA is more likely the right choice for you. The Valuation Master Class provides you with the head start needed to achieve the equity analysis edge you need in the CFA exams. Over the course of five modules, you will accumulate a portfolio of 56+ practical valuations on real-world companies. No other course provides the same opportunity to hone your equity analysis skills in the same way.